Look at me. There I am. Sitting in the middle. Ironic? Maybe. But its about to be the story of my life. I do know that mom came home from the doctor one day with pictures to show dad. When dad saw the pictures, he had a hard time breathing. He had to hold onto the counter and then sit down. Nana was there. She kept giggling and videotaping him. Mom kept saying something about a “Bonus Baby”. Then, they just kept looking at me and saying “Poor, Knox- he has no idea”. Of course I have no idea what any of this means! I do know that I have an awesome older brother and sister. When they told Aiden- he didn’t seem very happy and said something about moving out. 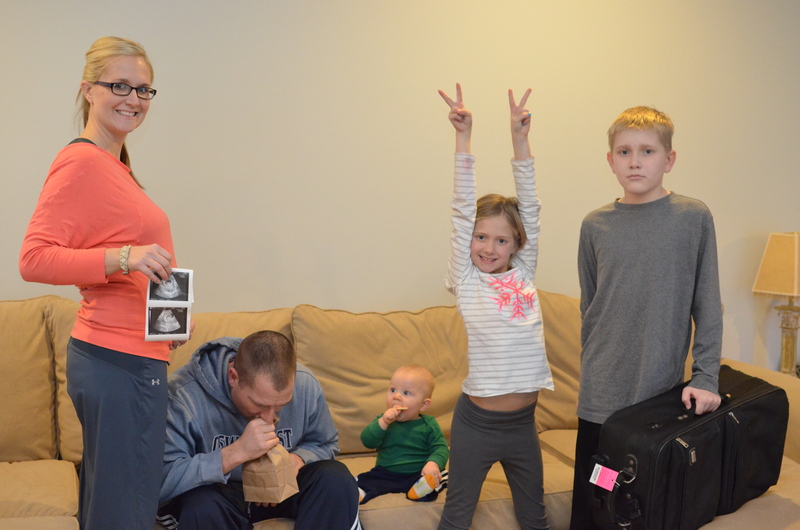 When they told Lucy- she said she was excited… as long as one of them was a girl?!? Now my house is being over taken with baby stuff that I am WAY too big to be playing with. And there are two of everything! Mom’s really letting herself go- her stomach is getting BIG! and whenever I cuddle with her, its like one of those massage chairs on my back. They keep saying August. Wait until August. and hopefully “the twins” will bake until August. All I know- if I have two older siblings… and two on the way… that leaves me to be the man in the middle.